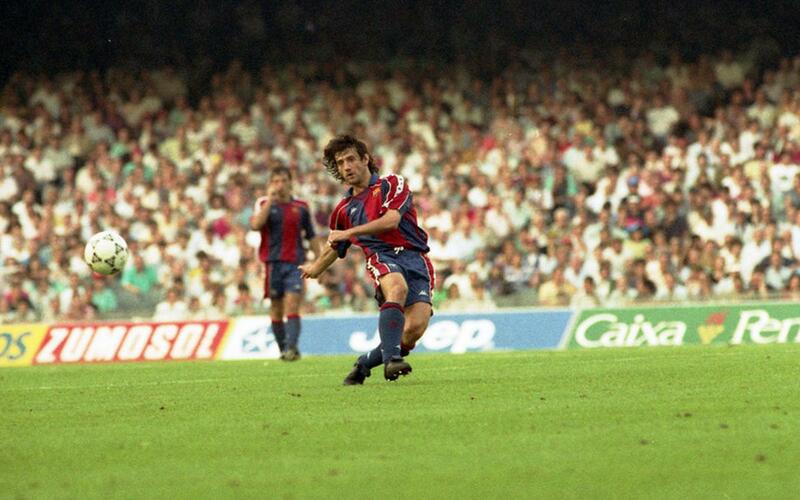 He signed for Barça in 1988 from Real Sociedad, and was an attacking midfielder who gave everything for the team as he linked up with the forwards. His amazing ability to lose his marker and terrific heading also meant he contributed a number of important goals. He immediately settled into the scheme of things under Johan Cruyff, showing excellent leadership skills and thanks to his versatility he soon became one of the most important members of the Dream Team, to the extent that many people described him as the heart and soul of the system. There is no doubt that the most decisive goal of his career was the one on November 6, 1991 away to Kaiserslautern, in the second leg of the European Cup round of sixteen. With thirty seconds to go, Barça were losing 3-0 and on their way out of the competition. Koeman crossed and Bakero sent the ball flying into the back of the German net. Thanks to that goal, Barcelona continued on a journey that would eventually take them to the Wembley final and the club’s first ever European Cup title. In July 2017 he took charge of professional youth football at FC Barcelona along wtih another former Barça player, Guillermo Amor.